Welcome to October! We had 105 projects linked up in September - let's see what this month brings! I'm very excited to introduce Natalia Bonner from Piece n Quilt as our featured designer for October! 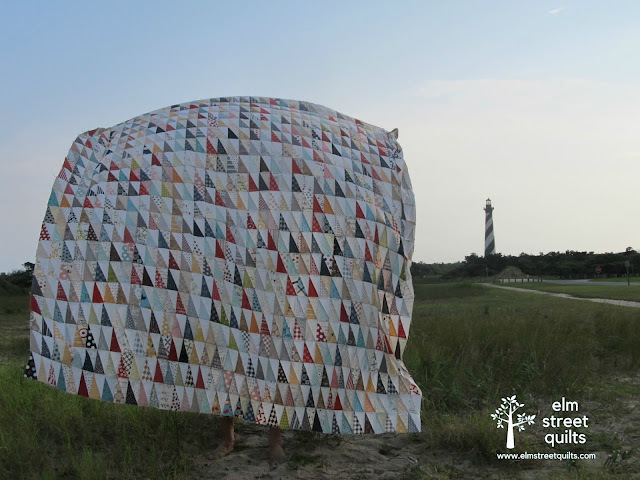 Natalia is an award winner quilter, fabric designer, teacher, quilt designer, author and LAQ extraordinaire! 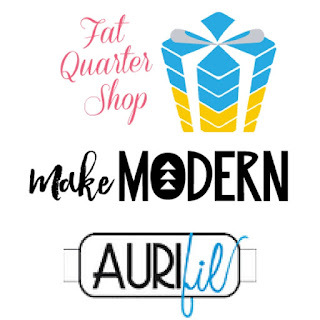 Natalia's online Beginner's Guide to Free Motion Quilting begins today, October 1 plus you can find her classes on Craftsy and her YouTube channel. She also has a 4-1 ruler for use when quilting with many supporting videos on YouTube that each how to use this ruler. Natalia partners with her mom, Kathleen Whiting, also an award winner quilting, for patterns and fabric designs. (See a cute mom / daughter photo on their about us page.) Together they have written five books and you will be inspired by her free motion quilting designs and tutorials. Their two fabric lines - Thrive and Flourish - are just beautiful and coordinate well together. Natalia is offering a pdf pattern of the winner's choice from her pattern shop. You can find Natalia at Piece n Quilt plus on her blog, on Instagram, on Facebook, on YouTube, and in her Pattern store. My goal for October is to get the quilting done on my half-rectangle triangle (HRT) quilt. There are 720 of these HRTs, all made with Moda Sweetwater fabric. The quilt measures 72 x 80. 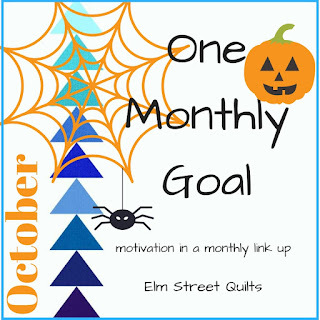 Elm Street Quilts One Monthly Goal October Linkup. Good luck Patty with your quilting this month. I still love your triangle quilt; it's so fresh. Have fun quilting your triangles! Thank you for this opportunity and for lighting a fire for me to get things done! Good luck on quilting the HTR quilt. Are you machine quilting it? I love your HRT top, Patty. I've wanted to make something similar with solid white/print fabric HSTs or pyramids or tumblers for a long time -- just love the simplicity of the design and the way those prints sparkle and dance across the snowy white background. Good luck getting it quilted this month! I love your half rectangle quilt--can't wait to see how you quilt it! Beautiful job on your HRT quilt! That's alot of piecing but I'm sure you know that now. Thank you Natalia, I'm loving two of your patterns already. Love that HRT quilt, good luck on your goal and thanks for the OMG link-up, so much fun, I'm getting things done. That's a lot of HRTs! Good luck with you goal!